We’re pleased to be able to feature another guest post, from another person the project has been able to help. John contacted us via our feedback form to let us know that he’d made use of the project database and found it useful – something we always like to hear, so do get in touch if you’ve found the same. We were doubly pleased that John agreed to put together this blog post, outlining how his research and that of the project intersected, and giving us a lot more colour on one of the accidents in the database. For three generations from before 1841 into the 20th century the landlords at the Fishing Boat Inn, Boulmer, Northumberland, were always a Bartholomew Stephenson, grandfather, father then son. The grandfather, Bartholomew Stephenson (1789-1872), and his wife Esther Addison (1788-1865) were both notorious Boulmer smugglers and from 1822 until 1866 Bartholomew was the coxswain of the first Boulmer Lifeboat. His family had lived in Boulmer and Seaton House since the time of his grandfather George Stephenson (c.1722-1811). 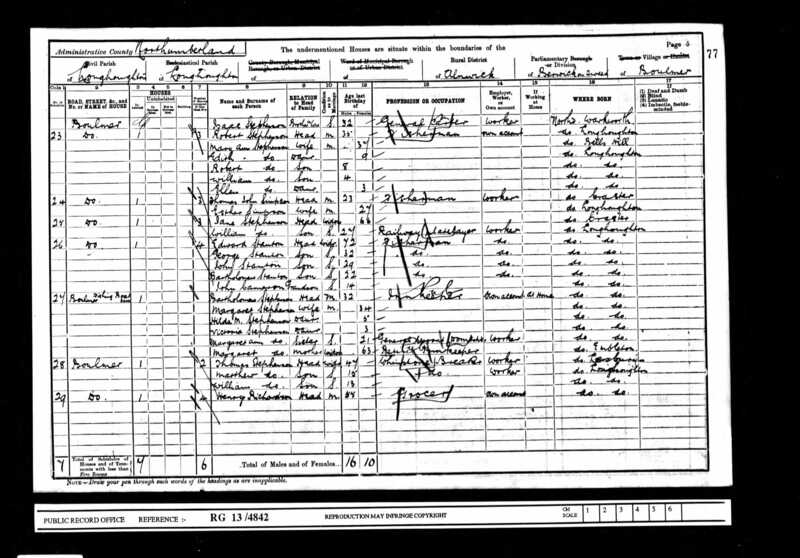 The father, Bartholomew Stephenson (1821-1893), and his wife from Craster, Margaret Archbold (1839-1925), succeeded the grandfather, then the son, Bartholomew Stephenson (1869-1915) in his turn became landlord. 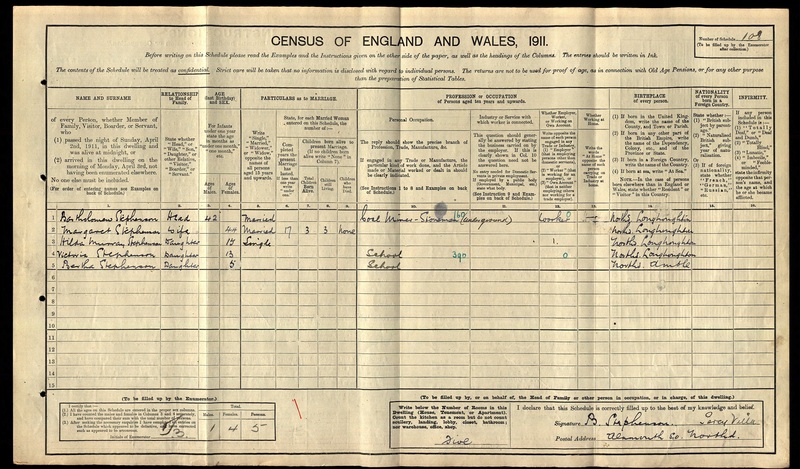 Census return for Boulmer, 1901. The Stephenson household is listed under entry 27. However, in the first decade of the 20th century the owner of the Fishing Boat Inn, the Duke of Northumberland, decided to appoint a manager from County Durham, leaving Bartholomew to seek employment elsewhere. By 1911 he was living at Percy Villa in Alnmouth and working as an underground stoneman at nearby Shilbottle Colliery. Sadly, a newspaper report of the accident and of the subsequent funeral at Longhoughton confirmed that this was indeed my cousin Bartholomew Stephenson: ‘…the North-Eastern Railway yesterday. The deceased, who was in the employ of company, had been working the line between Chathill and Falloden, and was caught by the 9.35 a.m. express, Newcastle to Edinburgh…’ (Newcastle Journal, 13 April 1915). ‘Percy Villa, Alnmouth,12th inst., aged 46, Bartholomew Stephenson. Interment Longhoughton, Thursday 15th, 2.30pm’ (Newcastle Journal, 14&15 April 1915). Bartholomew and wife Margaret Murray had three daughters. To my knowledge two of them married and had children – Bartholomew’s grandchildren lived in Cheshire and in California, where there are now great-great-grandchildren. John Davison Cameron, born 1950 in Newcastle upon Tyne, is a Northumberland family history enthusiast with a particular interest in the Stantons and Stephensons of Boulmer and the Archbolds of Craster.